Discussion in 'Video Cards & Monitors' started by kot0005, Oct 17, 2015. Going to have to decide between x34 and rog swift pg348q. I have had both and only different with the Asus is build quality. But the predator is a awesome screen also. What ever way you go you will not be disappointed. Is this a good monitor for someone who likes RPG's racing sims and occasional FPS games? I still cant decided between a 16.9 1440p high refresh rate or one of these. Does the black bars cause enough of a problem? and do people think this is the next step in monitor standards or is it just going to jump to 4k? For me I prefer the UW screen. The UW gets 100hz so thats enough for me. I play all types of games. Although I do not play competitive FPS games like counter strike and what not. And even 1080ti struggle to push 60frames in most games at 4K still I still think we are a while away before everyone is gaming at 4k. Looks like the rog swift pg348q is a go. Still need a better stand for it, the stock one takes up so much bloody room. yup Volta will be the next goal towards 144hz 4k gaming. We need a big jump in GPU performance for 100Hz 4k gaming, but high Hz needs a beastly CPU paired with fast RAM and fast communication network (Ring / Mesh / IF etc.) to complement it too. I can understand why most games will be aiming for 60Hz 4k or worse 30Hz 4k (thanks consoles). It's the opposite of what I want though, 1440p 120Hz > 4k 60Hz for me. I've been thinking about this for 6 months now but I think it's the UW aspect that is appealing compared to gaming as I'm only a casual gamer. PC has a GTX 1080 in it so should be enough to drive this thing but is it a waste of money if I don't play any FPS at all? PC gaming to me is really only strategy titles/city builders/XCOM. Am I wasting my money on something like this where a 60hz UW would be sufficient for those types of games? Lol just my luck... day after I bought my rog swift ple had an ex display model for sale at $1180. Missed out on it ><.... ah well still a good monitor. 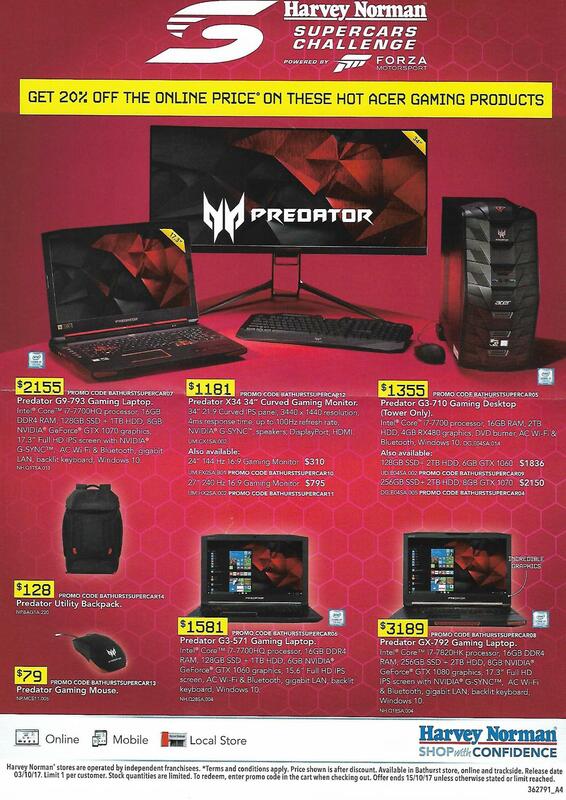 Harvey Norman currently has a deal going for the Acer Predator discounted down to $1181. Great monitor! Definitely notice the difference from 60hz to 100hz. Yeah, I've had mine since the middle of the year and no regrets - one of the best monitors on the market imo. BLB is pretty bad (worse than my Dell, actually) but I hardly notice it really. One question - what are people using for the monitor stand? I'm about to purchase a new desk and figure it's probably a good time to take a look at the stand situation as well as the standard stand takes up way to much room (the Dell was much better in this regard). I've got a $40 eBay adjustable desk mount coming so I'll try that out first before buying the stand alone stand. Has anyone tried mounting one of these on a Dell u3011 stand? It looks like a standard 100mm vesa config and can certainly handle the weight I'm just not sure if it will be OK for forwards/backwards balance. My initial plan was to get an ergotech arm but they can't be set up on a glass desk so I'm looking for a stand that will save space and give a decent range of motion. I’ve got mine mounted to a U2711 stand and it’s perfectly fine. Awesome thanks sickbunny. I'm a little too paranoid to mount to anything smaller than a 30" stand but it gives me options knowing it will work. I have mine mounted to a articulated arm clamped to the desk (well, the Asus version).